December 14, 2018, 9:04 a.m. While many have yet to even start this year’s Christmas shopping, a new YouGov Omnibus survey reveals that 3% of Brits have already bought presents to be doled out for Christmas 2019! A further 2% expect to do so prior to Christmas this year, while a further 3% look set to exploit the Boxing Day sales, saying that they will have bought presents between Christmas and the end of the year. One in twenty likewise seem to have their eye on bargains during the January sales, with 5% expecting to have started their shopping by the end of the first month of 2019. 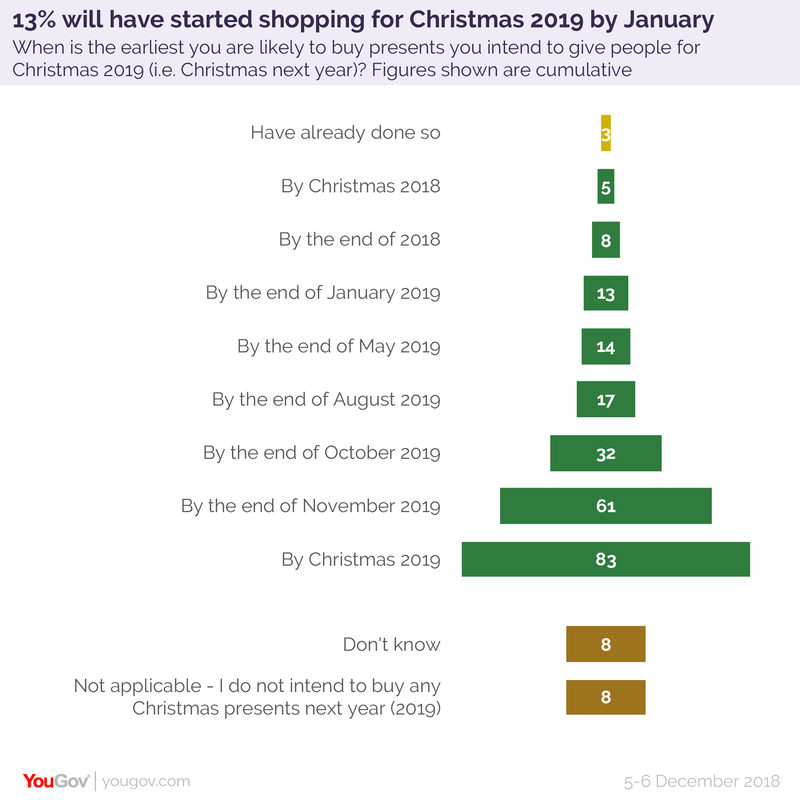 This means that within the next couple of months one in eight Britons (13%) will have already started their 2019 Christmas shopping. Few extra Britons are added to that total over the spring and summer – just 1% expect to have bought their first stocking filler in February to May, while another 3% anticipate having done so during June to August. Things pick up in the autumn, with 15% saying they will have started shopping in September or October. This figure almost doubles in November – the month of Black Friday – with 29% expecting to make a festive purchase in this period. A final 22% are going to wait until this time next year before they start their Yuletide procurement. The remaining 16% are split between 8% who don’t know when they’re likely to start shopping and 8% who won’t buy any presents at all. The youngest Britons – those aged 18-24 – are the most likely to leave things the longest, with almost two third (64%) believing their first purchase won’t come until November or December next year. For the older age groups this figure is much closer to half (45%-53%).